We’ve always wanted to know a magical character who doesn’t shroud himself in complete mystery. Someone who would refer to himself as “The Wiz” as opposed to a convoluted wizarding name (we’re looking at you Albus Dumbledore). 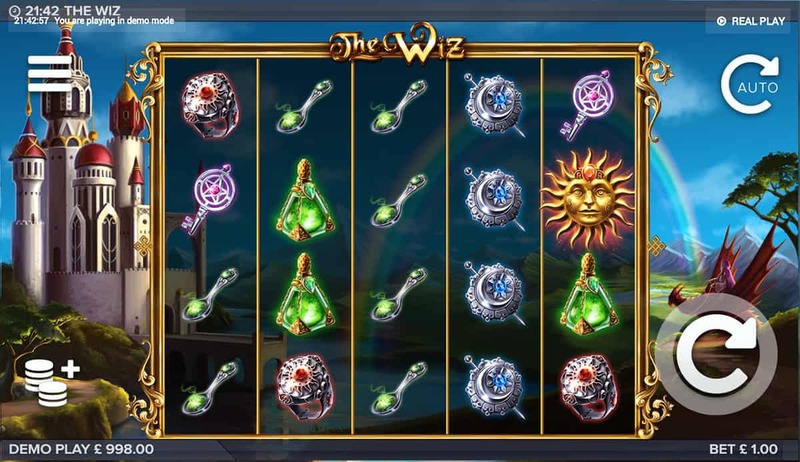 ELK Studios gives us that very character on The Wiz, Slot. A five reel, 178 Ways to Win slot that takes us back to medieval times, when magic was great. And when The Wiz was doing his thing. It’s almost as if we’re back in King Arthur’s time in our very own slots Camelot. In the background we have an ornate castle while on the other side is a dragon, sitting just under the rainbow. It’s a land of myth, intrigue and magic but it’s the reels in the middle which contain the reel magic. The main symbols are made of magical artefacts, such as Spoons which have been dipped in potion, Brooches, Rings, Potions, Moons, Suns and Treasure Chests. All look like something we’d find in a wizard’s armoury. The Dragon is the Wild and when it forms part of a winning combination, it spits out fire in celebration and lets us know how much of a fiery Multiplier it’s breathing onto our stake. 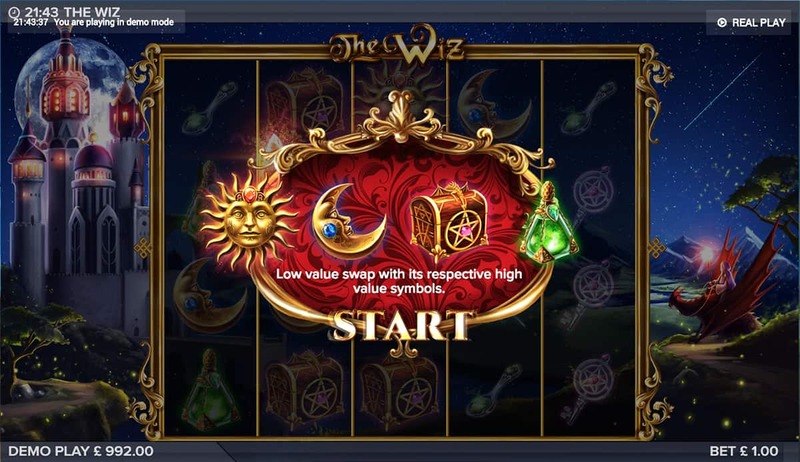 As an ELK slot, we benefit from the various betting strategies, which can be easily accessed by selecting the coin button at the bottom left of the screen. From there we can select our total bet or go through the Betting Strategies, such as Optimizer, Jumper and Booster which change our bets accordingly. Nifty. 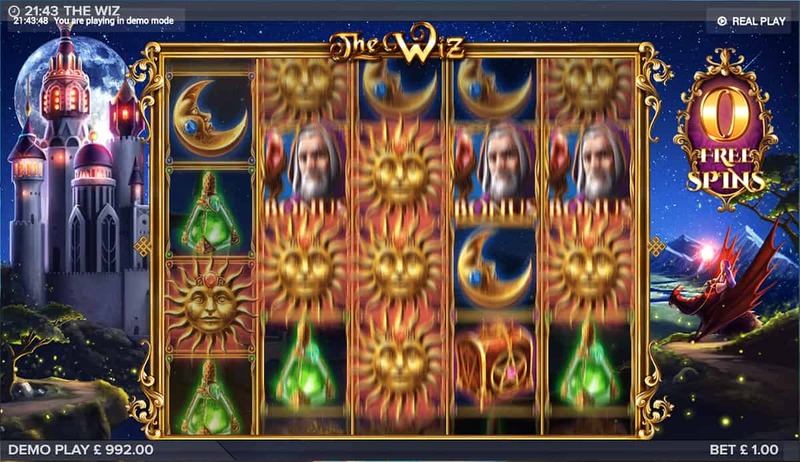 On to the slot itself, the Wizard is the Scatter and when he appears twice or more, he triggers the Wizspins Bonus Game. 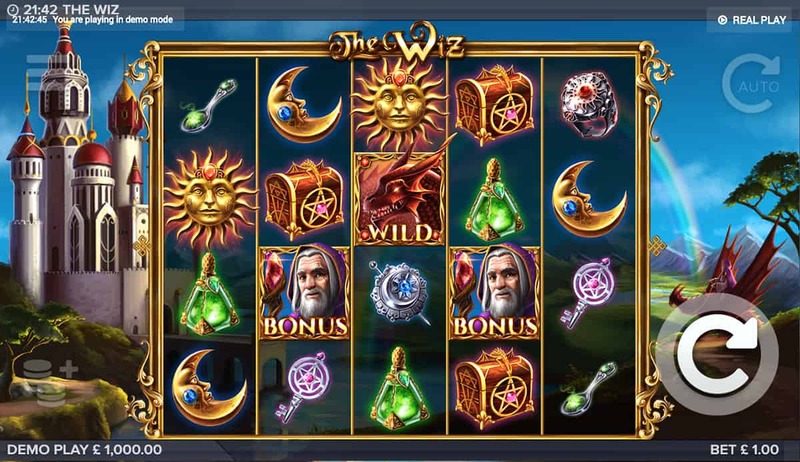 Two, three, four or five Wizards give us one, five, seven or ten free spins respectively. During these spins, each Wizard that subsequently appears gives us an additional free spin. Just like magic! We can also use the Multiplier Wild feature, when the Dragon Wild is in use, but this time it can transform into a Walking Wild, moving across the reels to keep our Free Spins growing and growing! Ok, so we didn’t get the cool, backwards baseball hat wearing wizard we thought we might. But then The Wiz is much cooler by being an authentic wizard that really does bring magic to life. We reckon he’d still refer to himself as “The Wiz” in third person though. 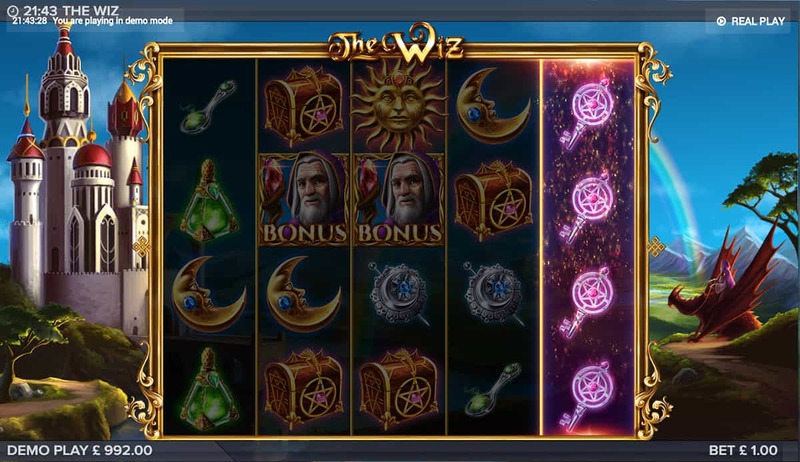 Detailed graphics breathe a fresh fiery air into medieval times and the Wizspins Bonus Game is literally awesome. Not just because of its name (though that is pretty great) but because of the massive amount of Free Spins that can be won. With payouts of up to 5,000 times on each spin thanks to the Dragon’s Multiplier, it’s more lucrative playing this than being a monarch during King Arthur’s time. Magic.